The lodge serves a savory selection of Belizean and Caribbean style cuisine. All meals are freshly prepared, including our tasty breads and scrumptious deserts. If you add the All Inclusive Package, breakfast, lunch and a three course dinner are all included. If you are on a tour during lunch, a picnic lunch is provided. If you are not on a Package, meals may be purchased a la carte from our breakfast, lunch and dinner menus. Join us each morning between 6:30 and 7:30 AM on the Bird Deck to watch some of our feathered visitors, while you enjoy your first cup of joe. All meals are prepared fresh daily, including our tasty breads and scrumptious desserts. Start your day with a taste adventure. Our menu includes all of the typical fare you would expect, plus local Belizean favorites like fry jacks, flour or corn tortillas, burritos and huevos rancheros. These dishes are accompanied by refried beans, plantains and tasty greens with names like callaloo and chaya. Hint: Try a stuffed fry jack - this is flour tortilla dough, deep-fried in coconut oil and stuffed with your choice ingredients. A favorite stuffing is cheddar, cheese, onions, chaya and scrambled egg. Try our Belizean sampler made up of salbutes, garnaches & panades. Our famous quesadilla, with cilantro pesto, mozzarella and feta is a real taste treat. There are also normal quesadillas, nachos and burritos for local fare. Our lunch menu also includes salads, burgers (fish, chicken or lamb) and an assortment of sandwiches, including eggplant and chicken parmesan. If you’re not a meat lover, most of these dishes can be served vegetarian style. Dine Al Fresco on our Bird-Deck, perched in the canopy or in our enclosed dining room. Indulge your taste buds with savory tropical dishes such as, potato chaya soup, calypso chicken or coconut shrimp, served with side dishes, like coco yam or chaya, or try one of our meat selections like thyme-lime-lamb or moho pork chops. Choose from soup or salad served with a basket of homemade bread, a meat, seafood or vegetarian entree. Sides include a starch plus seasonal vegetables, dessert and coffee or tea. *Please do let us know if you have any special dietary needs and we will do our best to meet your requirements. 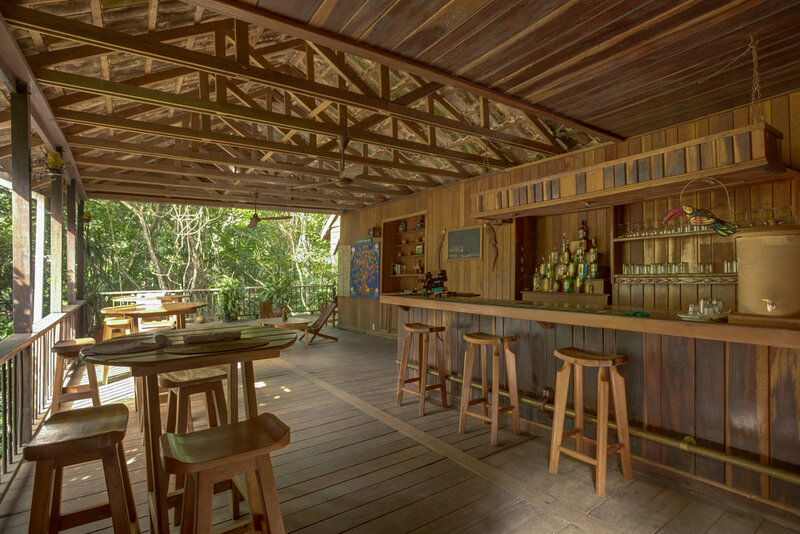 Our Treehouse Bar comes complete with friendly, engaging bar servers. We offer everything from non-alcoholic smoothies and fruit juices to Belizean rum and beer. The typical range of alcohol for your choice of plain or exotic drinks, plus a selection of red & white dinner wines are also available. Try a fruit juice that you may have not tasted before, such as sorrel or carambola. Sorrel juice is made from a red hibiscus and goes very well with vodka - much like cranberry juice. Carambola is commonly known as star fruit and has a unique taste. Good in smoothies with other fruits. Oh, yes - don't forget to ask for your complimentary tropical fruit punch. Add local rum if you prefer.